Vasa Swim Ergometer & Swimming Machine | Vasa Inc.
Equip your Vasa SwimErg with these adjustable length webbing straps and use it like a Vasa Trainer! Doing so increases the versatility and value of the SwimErg by providing a number of swim-specific drills, functional strength, & rehab exercises. 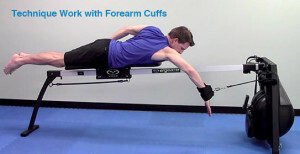 Note: The Forearm Cuffs used for swim-specific drills are sold separately. I consider the Vasa Swim Erg a must have tool. In my experience it correlates well with water swimming so I substitute 2 of my 4 swims with the erg. It’s easier than water to focus on perfect form. Take your swimming up a notch. 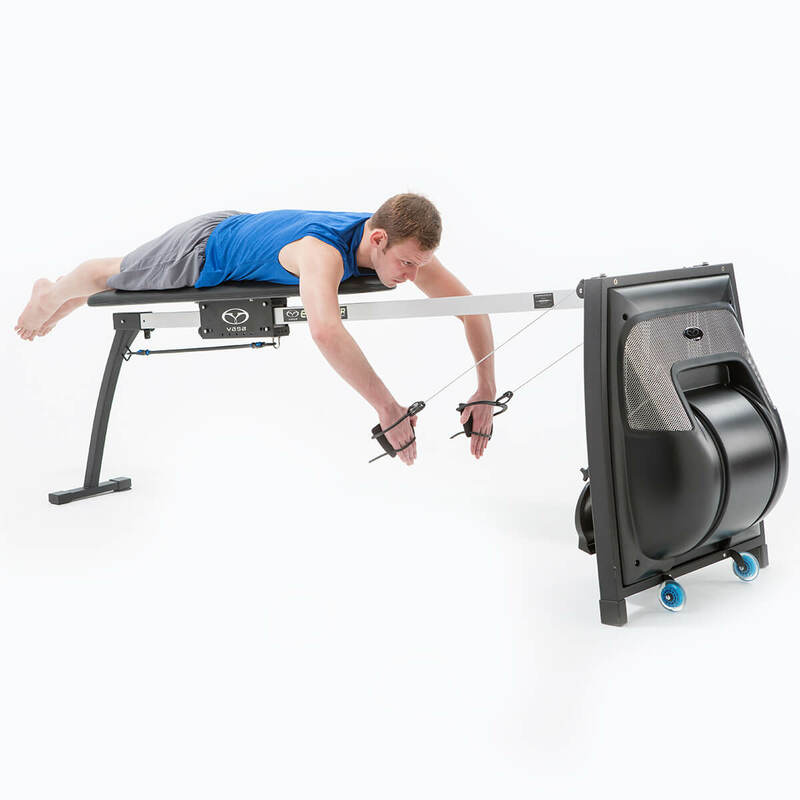 Maximize your power and stamina while improving your technique outside the pool with the Vasa Swim Ergometer swimming machine. 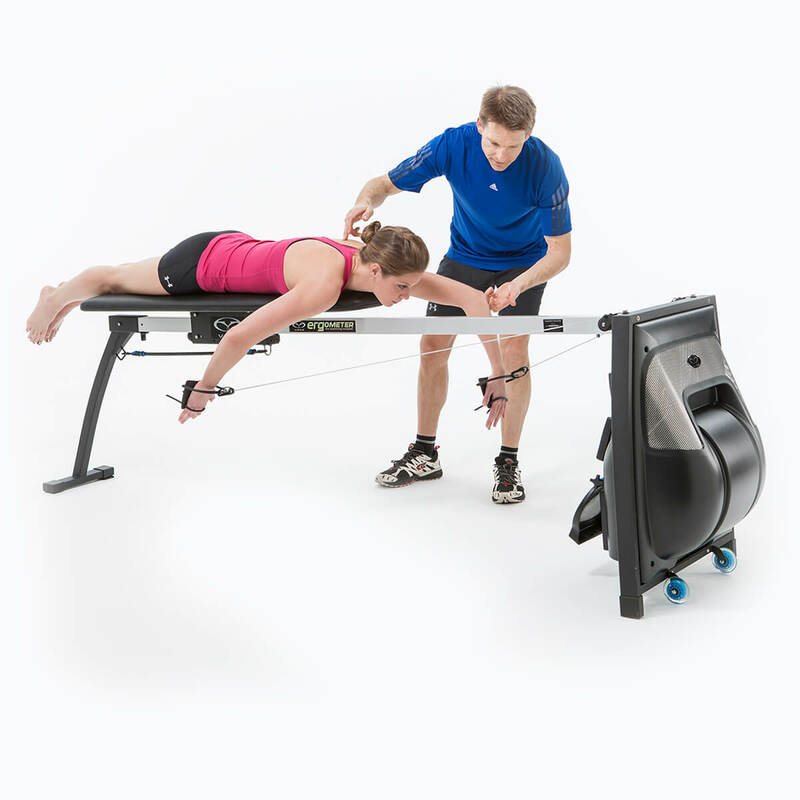 The Vasa Swim Ergometer is the ultimate swim bench for improving endurance, sustained power and stroke technique. Get outstanding results for developing swim-specific power and endurance. The Erg’s adjustable airflow system simulates the resistance experienced while swimming in water. You will build endurance and staying power as never before, and prove it with the Power Meter’s reliable, repeatable metrics. Try it for yourself for 3 months, risk-free—your improvement will be dramatic. 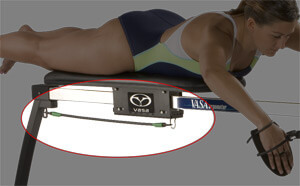 Consider the NEW Vasa SpaceSaver SwimErg and portable Sport Bench for a compact training solution. This combination takes up less space and offers outstanding training value. Make sure you have everything you need for your training with SwimErg Accessories. The Vasa Swim Ergometer is the choice of top professional, olympic, and amateur athletes as well as renowned coaches around the globe. It will help you swim faster and reach your performance goals efficiently. The Vasa Power Meter completes your swim training system by providing instant feedback on your performance. Measure time, distance, pace, stroke rate, watts, and right arm / left arm power balance. Stay motivated, train smarter and have fun! 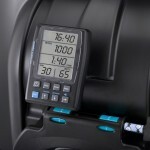 Provides precise, real-time data on the LCD screen only. Track your daily and cumulative workouts manually to evaluate overall performance gains. View live workout data on the ANT+ Power Meter LCD screen as well as have the option to transmit the data wirelessly via ANT+ technology. Connect to a third-party power monitoring devices such as Garmin(TM) device that receives bike power profiles, or applications like TrainerRoad(TM) or Training Peaks(TM) to enhance your options for viewing, logging, analyzing and sharing your workouts. Learn more about the ANT+ Power Meter. 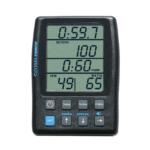 If you purchase an Erg without a Power Meter, it’s easy to upgrade later with the Electronics Upgrade Kit. 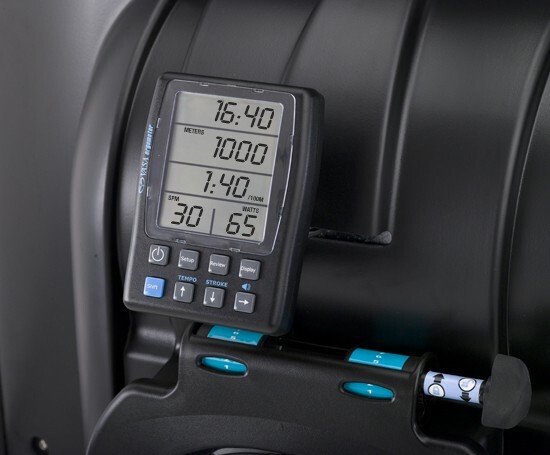 *Note: If you purchase a Vasa Swim Ergometer without a Power Meter, it’s easy to upgrade later. Learn more here. NOTE: for those with space limitations, we offer the SpaceSaver SwimErg as a compact, fully functional training solution. When paired with our portable Sport Bench, this combination requires far less space and offers outstanding versatility and value. The SwimErg is shipped in 3 boxes with a combined weight of 104 lbs. (47 kg). Additional accessories may require additional boxes. How easy is the Ergometer to assemble? If you need help, please call Vasa’s customer service and technical support toll-free at 1.802.872.7101 M-F, 9am-5pm Eastern Time. How much space does the Ergometer take up? The Swim and Kayak Ergometers are 8’ 6” long x 28” wide. We recommend a usage space of 10’ long by 4’ wide, to allow the full range of motion in every direction. What is the recommended environment for the Ergometer? 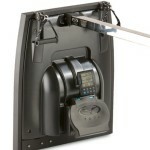 The Vasa Ergometer is designed to be used and stored in relatively dry areas with low humidity. Because of its sophisticated electronics and internal configuration, we do not recommend using or storing it for long periods of time in environments with high levels of chlorine or ocean air. If used on pool decks, we strongly recommend placing it on a dry floor during use and then storing it in a dry area with low humidity and low chlorine levels in the air. 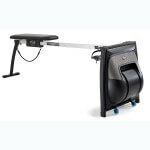 Regular maintenance of your Vasa Ergometer is an important component of years of enjoyable, functional, and safe use. Maintenance requirements will vary considerably depending on how much use your Vasa Ergometer gets. Please read the guidelines carefully, as these recommendations are made to help you maintain your Vasa Ergometer most effectively. How do I adjust resistance on the Vasa Ergometer? 1. 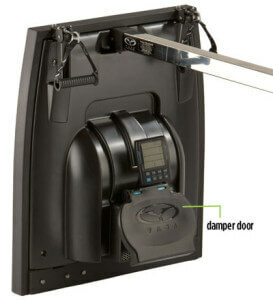 Damper Door: You can open the door in 7 increments. Setting number 1, when damper door is fully closed, provides the least resistance. It feels like swimming with a current or like paddling downstream. Setting number 7, with the door is fully open, provides the most resistance. It feels like swimming against a current or paddling upstream. 2. Flywheel: Variable wind resistance feels like the resistance of swimming in water – the harder & faster you pull, the more resistance you feel. 3. Trainer Strap System: This popular accessory utilizes a strap system and rubber tubing allowing the ability to perform a series of key swim-specific strength exercise. NOTE: Tether Cords are rubber cords that are designed to prevent the seat from rolling too far forward. For example, if you set the damper door fully open at number 7 and want to do butterfly intervals applying maximum force, you would attach the tether cord. Every new Vasa Ergometer comes with one tether cord. 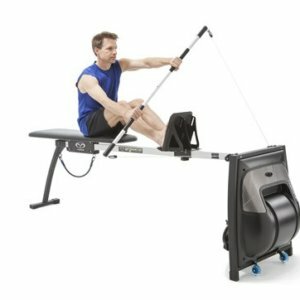 Which Ergometer model is right for me? 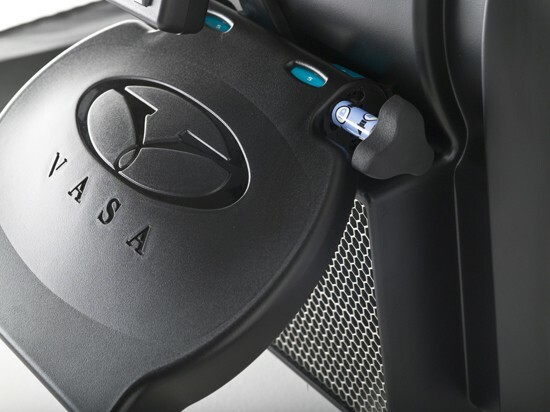 The Vasa Ergometer is currently available in multiple options, including: Swim and Kayak. The Swim version includes handles and swim paddles. 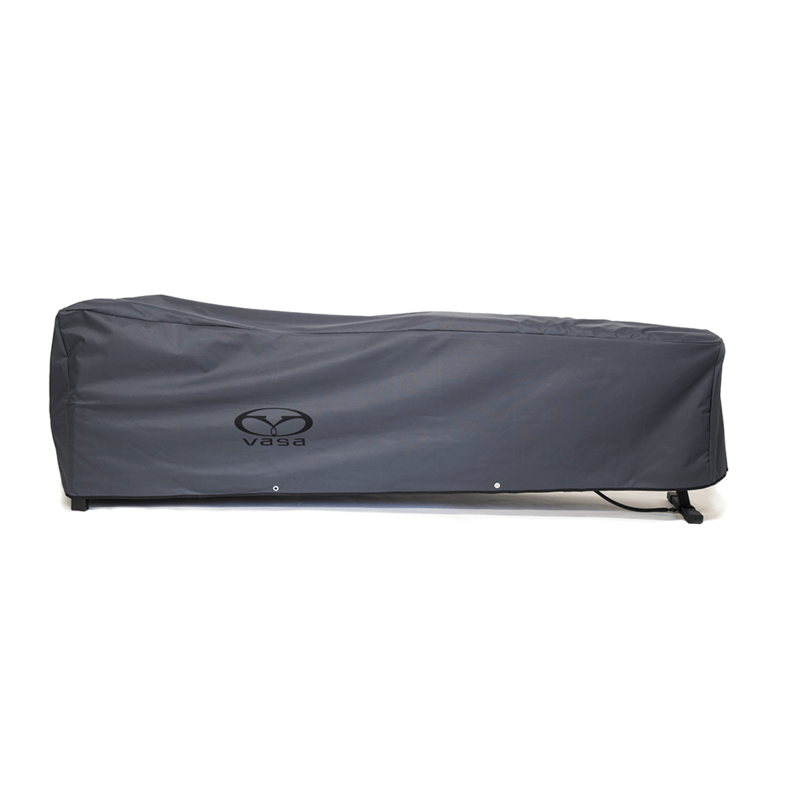 It is perfect for swimmers, triathletes, and anyone looking for a freestanding, versatile unit. The Kayak version comes with a foot brace, kayak paddle shaft, an alternative monitor mount, and a pair of exercise handles. By purchasing the swim paddles and a few minor adjustments, the Kayak version can also be used for swimming exercises. 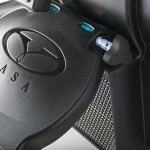 The SpaceSaver version comes with a wall mounting bracket, exercise handles and swim paddles. It is can be used with most standard freestanding benches (sold separately) for a wide variety of exercise options. All versions allow you to attach Ankle Straps for leg exercises or use the Exercise Handles for a variety of functional upper body exercises. Cross Country Skiiers should contact Vasa to discuss which version is best for their training needs. Is the Ergometer safe for people of all ages / abilities? The Vasa Ergometer is simple to use, sturdy in construction and completely safe for use by people of all ages and abilities. It is easy to determine a safe operating resistance. If your children safely play on a jungle gym or other playground equipment, then they’ll safely enjoy the Vasa Ergometer. 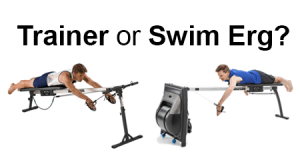 The Vasa Swim Ergometer and the Vasa Trainer both help you become a stronger, faster, and more powerful swimmer. You will accomplish more in less time, thanks to the high quality training they provide. If you want to see a side-by-side comparison of how each ranks by training benefit, review our Model Comparison Chart. What exercises can I do on the Ergometer? In addition to the primary sports-specific training, you can perform a wide range of exercises on the Vasa Ergometer. You can do functional training exercises for strengthening abdominals, arms, back, chest, shoulders and legs. Each exercise can be performed at a resistance setting that is appropriate for your specific need, be that strength, power, speed, endurance, rehabilitation or flexibility. Make sure to order the Exercise Handles if you wish to perform these useful exercises. Add the Trainer Strap System (accessory) to greatly increase the number of swim-specific strength exercises. Accomplishing a complete hip roll and body rotation on any swim bench cannot be simulated perfectly. This is because the axis of rotation while swimming in water is a straight line through the center of your body. On a swim bench, the axis of rotation is about four inches below the stomach, which requires the swimmer to roll over, rather than with, the axis of rotation. In water, the body is buoyant, which allows the swimmer to catch the water at full arm extension and initiate the arm pull with a hip rotation by driving the opposite hip toward the bottom of the pool while pulling with the opposite arm. The hip rotation engages the core abdominal muscles and transfers that energy into the pulling arm. To a degree, swimmers can effectively condition the core muscles used in hip rotation while training on the Swim Erg. 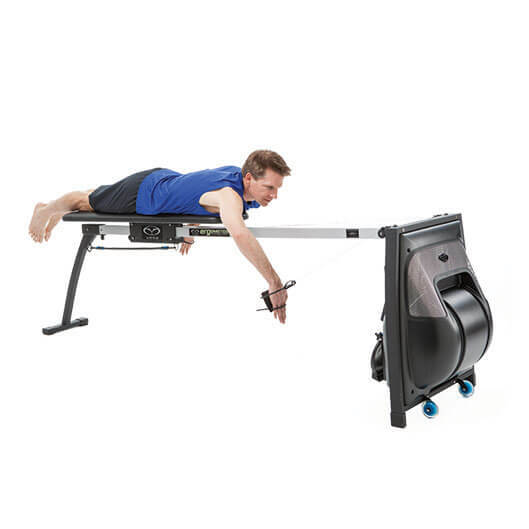 The padded benches on Vasa Ergometer (and Vasa Trainer) are designed to allow the swimmer to activate and strengthen the core muscles used in hip rotation while performing Freestyle exercises. This is accomplished by simultaneously driving one hip into the padded bench just at the catch of the opposite arm. If the swimmer uses proper stroke technique, then hip rotation on the bench will activate the correct muscles of the core torso and will provide better conditioning. The difference between swimming Freestyle on the bench with and without hip rotation is quite noticeable. Swimmers can find slight destabilization and greater activation of core muscles by swimming Freestyle while laying on a long Aeromat pad, a rolled up towel or placed lengthwise on the Vasa padded bench. 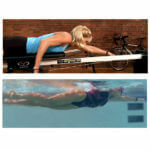 Yes, it’s easy to simulate typical pool workouts using the Vasa Ergometer. Many swimmers and coaches use it for intervals, timed sets or long aerobic workouts. The Vasa Ergometer allows you to do swim-specific aerobic or strength sessions effectively, on your own schedule, in the comfort of your home, or club. The gains made by using the Ergometer are easily transferred to the water. 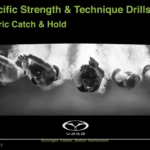 Vasa SwimErg works on catch, swim strength, proper positioning, and pulling with the right muscles. I have such a busy life, it takes one hour of travel to get to the pool. 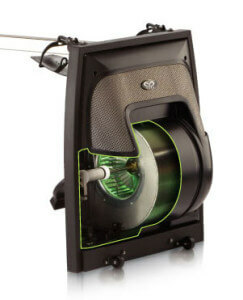 The Vasa provides instant feedback without going to the pool. I am super happy with the ANT+ Power Meter as it allows me to quantify every workout and track evolution in TrainingPeaks. We are very happy with the swim ergometers – not only do they offer exceptional performance; they also have design elements and functionality that are excellent. We are currently using them for dryland training and conducting physiology research using hypoxic conditions in our altitude chamber. The Ergometer is an incredible device, topped only by the customer service representatives who help service and educate users on it. The team that I coach has used both the Ergometer and the Vasa Trainer as a critical component of its training regimen and we have had exceptional results as a result. This is a good tool for building swim muscle strength. It has not made me a faster swimmer, but it has helped to condition my muscles. Hopefully, the speed will come with more Vasa and pool workouts. A great tool to get a quick and focused swim workout in a much more time efficient manner. While it is not a replacement for pool work, it has greatly helped my swim by allowing me to get a solid and very swim-specific workout when going to the pool is not feasible. A great product! Now that I’m a masters swimmer, I’m okay with not doing too much volume in the pool, but I do like to mix up my training and the Vasa Ergometer is an excellent addition to my training program. I’ve had it for about five years and I use it regularly. I usually either use the Vasa as a separate workout or as part of a land training workout, where I’ll do a few sets at a short interval with high cadence and high resistance. And now that my kids are swimming, they’ve started using it as well. My Vasa is the best piece of equipment that I have in my home gym and it’s one of the reasons why I still get so much enjoyment out of swimming and training. My secret weapon to getting swim workout done in an expedient fashion. Very focused. It is a great tool to be able to see your stroke out of the water so you can work on it. I purchased the Vasa Erg in May 2016 so that I could gain more swimming practice time without the nuisance of the drive to and from a pool, pool availability, and pool costs as the majority of my real swim time is in a lake. I did not realize how poor and inefficient my form was until I set a camera on a tripod, videoed myself and then reviewed the video. The Vasa has been invaluable with correcting my form. I am now able to achieve a nice high elbow throughout the pull and do that consistently, which I did not do before. My actual swims have become easier as I am using much better form, so that I can do harder and longer workouts. My form correction is a direct result of using the Vasa SwimErg in conjunction with a video, especially since there is no video distortion due to seeing through water and the video is always at the same position relative to me. This is a great piece of equipment, I use it frequently for usually short training sessions when I can’t find the time to get to the pool. I’m a shift worker and sometimes it seems impossible to get to the pool for many days, so the Vasa Ergometer is an excellent way for me to get some much-needed training in when normally I would have just missed out. My swimming has improved beyond anything I could have ever hoped for. I love the Vasa and would recommend it to anyone who is looking to become a stronger swimmer. Improved my open water performance in one season from 1:05 h to 59:30 min. Working with ergometer was hard initially. Then I focused on technique and did frequent but rather short training sessions (3-5 times a week 20 mins). I use mine primarily to get in paddling shape for surf trips. Aside from Waikiki style small wave long boarding intermediate and advanced surfing is about 90% paddling fitness. As a now landlocked Washington State surfer who travels to fairly heavy spots a few times a year I have found the erg to be indispensable for preparation. This is after years of trying various gym exercises, time in the pool etc. I purchased my VASA ERG almost 2 years ago. It is undeniably the single best piece training equipment I have purchased. I use the ERG every other day to supplement my swims. My endurance and strength – and subsequently my speed improved greatly. I also have two junior swimmers. I started my 10yr old on it last year and she mad JO ( state level gold times ) at 9! It’s a family affair and my 6yr old is already trying to get in on the training! The machine is so versatile. I can train for SUP, Kayaking and free, breast and fly. I tell all my buddies it’s the single best thing they can own. 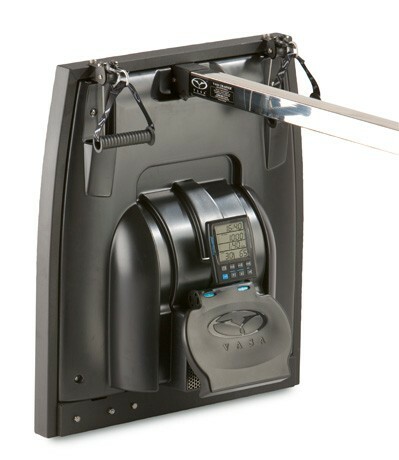 The Vasa Swim Ergometer is a versatile piece of equipment you should consider to have in your locker. period. I was able to continue (dry-land) swim-training to maintain a reasonable level of cardio-vascular fitness. In fact, my swimming improved when I returned to the pool! I’m more than happy to recommend it as a product. it gives you flexibility when getting to the pool is difficult, certainly, it provides a workout as intense as any session and online videos teach you good form which also prove useful for the pool. So when that early morning rush to the pool doesn’t quite seem on..you relax and think there’s the Vasa! One of my frustrations with swimming are the large administrative costs for me to get to a pool. I generally have to get my workouts in before 7am, so maximizing this time is essential. I don’t mind swimming laps, I just have trouble justifying all of the lost time commuting to and from, pool hours limitations etc. Enter VASA. I decided to try and leverage the time savings the Vasa Erg offers with a goal of improving swim times, but also spending more time running and biking. Unfortunately, there is a paucity of swim coaches who would embrace and help guide my “swimming without getting wet” approach. Swim coaches’ general knee-jerk response to the question – “how do I swim better” is “swim more”. I found coach Eric Neilsen at TSRF and reached out to him to provide guidance on how to best utilize my time on the Vasa. He is not only a gifted swim coach, he is a Vasa advocate and experienced user. He was very accommodating and supportive of my situation, and I feel the workouts that he provided and the training build he designed were really productive. Because there are metrics associated with a Vasa, I could see my power and pace improving. I knew and could feel I was stronger. I proved that in a few of my rare pool workouts, as well as in setting swim leg PR’s in several triathlons leading up to IMMT ’15 and IMWI ’16. I am very pleased with my swim times in races relative to my build, and plan to continue to primarily use a Vasa as my primary swim training accessory. Being a coach and athlete, I am always looking for ways to maximize training time. The Vasa Erg does just that! You can play with applying different amounts of force, at different phases of your stroke (both swimming and kayaking) to find what is optimal for you in generating max power. Then with continued refinement of your biomechanics, you can determine your maximum sustained power for a given distance or time. Many triathletes would like to improve their swimming, but extra time in the pool usually comes at the expense of cycling or run training time. I have found that as little as two to three 15-minute sessions per week on the Vasa Swim Erg can yield incredible results. The Swim Erg is to swimming what the CompuTrainer has done for cycling. This past year the team lost considerable water time so we added more Vasa Trainer & Ergometer training and we had our best year ever. I have no doubt the Vasa’s were a big reason why. Todd and I have been using the Vasa Ergometer for a year now and we use it as both a supplement and substitute for the pool as well as for general conditioning. It has been a huge time saver for us as we both work and have 3 kids with their different activities to add to the mix. We have gotten stronger and have the confidence that even if we skip the pool we are still able to get a functional swim. The most revolutionary aspect of the Vasa Ergometer is its ability to simulate the demands of paddling a surfboard and swimming. I use it myself and with all my clients to improve aerobic conditioning and more specifically as a part of our surfer and triathlete fitness programs to increase speed and power. Simply put: There isn’t a better product that addresses the sport-specific needs of swimmers and surfers so efficiently and effectively.